1 Pre-heat the oven to 150°C, 130°C fan, Gas Mark 2. 2 Heat half of the oil in a large heavy-based frying pan. Add the onion and garlic and cook on medium heat for 7-10 minutes, stirring constantly until onions soften but do not brown. Remove onions and garlic and place into a large casserole dish. 3 Heat the remaining oil in the same frying pan. Add the beef and cook on medium high heat for 5-10 minutes until the beef browns on all sides. 4 Add the beef to the casserole dish. 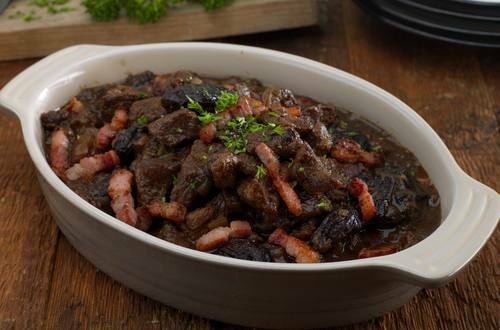 Add the GUINNESS®, treacle, Knorr Beef Stock and the prunes. Cover and transfer to the oven to cook for 3 hours stirring halfway through. 5 About 10 minutes before the beef has finished cooking, heat a frying pan until hot and dry fry the bacon, stirring often, until crispy. 6 Remove the casserole dish from the oven. Garnish with the bacon and serve at once.